In this Q&A Session, Host, Matt Heinz explores customer communications options as it relates to increasing engagement. Conrad Bayer works with early stage enterprise software companies to provide guidance, insight, and leadership to grow the business and build shareholder value. Conrad also possesses a broad range of skills focused on understanding enterprise customers and the engineering background to deliver great software products. 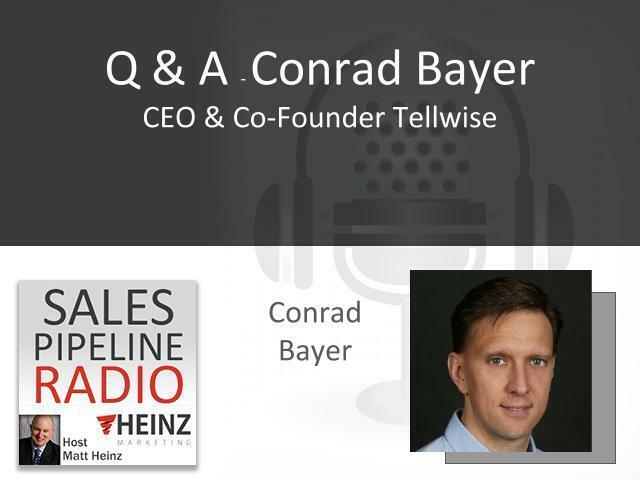 Additionally, he has successfully created an enterprise software company which was acquired by Microsoft in 2005 and is currently the CEO and Co-Founder of Tellwise, a communication platform which delivers quality insights to help salespeople sell smarter. Tellwise is smarter customer communication that drives significantly more customer engagement for sales teams of all shapes and sizes. From field sales and partner channels, to inside sales and customer care, Tellwise delivers a richer, more robust experience that speeds the sales cycle and creates happier customers. Seller productivity. Pipeline insights. Customer experience. That’s Tellwise.